Where is Explorer Guy Now? I have sent the Explorer Guy to one of the places that is reported to have the best wreck diving in the world, Truk Lagoon. The new name is Chuuk but I wanted to use the name most people are familiar with. Truk is an island group in the south western part of the Pacific Ocean and is one of the four states that comprises the Federated States of Micronesia in what is called the Caroline Islands. 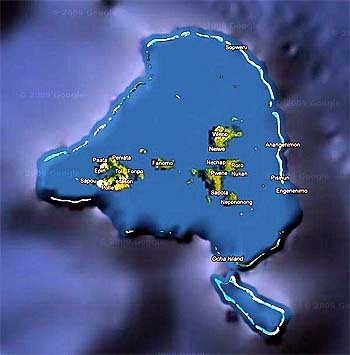 There are 607 small islands. The total land area is only 270.8 square miles but it occupies more then one million square miles of Pacific Ocean and ranges 1700 miles from east to west. It is about 2500 nm south west from Hawaii. The Truk group is 3493 nm from Honolulu. There are no yacht facilities in Truk, but there is Baker Dock, a 300' long pier at the north entrance where visiting yachts can tie up. See link below or the book "Landfalls of Paradise" by Earl Hinze, Jim Howard. I would also recommend that you check out the other islands in the group as they all have a reputation of being stunning and friendly places to visit. The Micronesia island group is an area where an Expedition Yacht will shine having the abilities to be very self sufficient and will not put any stress on the local communities. If anyone has any updated information or comments Please Send Them To Me to be posted. Link to book "Landfalls of Paradise"
Back to the Explorer Guy Page.